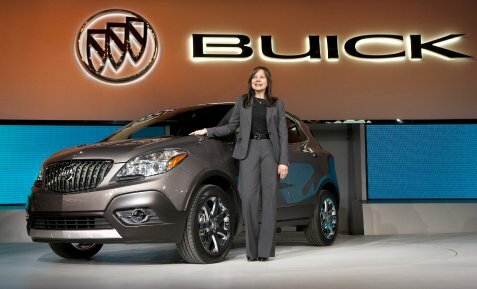 We were present at the second day of the North American Auto Show for the Buick Press Conference where the event started with Buick VP Mary Barra speaking about the Buick comeback that started with the Enclave launch five years ago. The Buick Achievers Scholarship program has the Buick brand more involved than ever at college campuses throughout the U.S. The crowd was then introduced to the stylish 2013 Buick Encore, which is a graceful five-passenger compact luxury crossover that features the first use of QuietTuning active noise cancellation technology in any Buick automobile. Buick is really targeting folks with an active lifestyle that also want a contemporary package with a smooth and quiet ride. The Encore interior rivals much more expensive competitors and a flat load floor for various storage options. With OnStar, all-wheel drive and intellink, the 2013 Buick Encore is going to be safe and forward-looking in regards to driver safety. It’s clear that Buick is attracting younger and progressive buyers with the Regal and Verano, so when you add the Encore into the Buick family, we anticipate sales to continue upwards in the coming years.